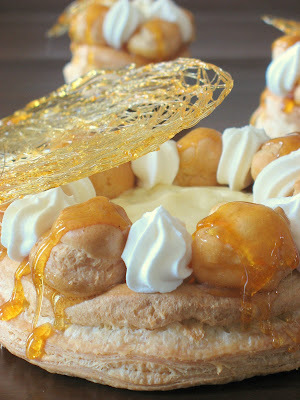 Tartelette: Gateau Saint Honore - We Dare You! - Turns out that May 16th was Saint Honore (pronounced o-no-ray) Day, patron Saint of pastry chefs and bakers. - It is the “must pass” element of pastry school students and it is a cake that includes several elements and techniques that bakers should try at least once: puff pastry, cream puff dough, caramel and pastry filling. - We are Daring Bakers after all! I compiled recipes from Bo Friberg’s books “The Professional Pastry Chef” editions 3rd and 4th, and "The Advanced Pastry Chef". It is straightforward and very close to what you would find nowadays walking on the streets of Paris and popping into a bakery (close our eyes, you’re there). I realize it calls for time consuming puff pastry so you can use store bought, but if you have never made it why not try? It is just a long process, but the recipe given below makes more than you need so you can freeze it and use it later for something else. 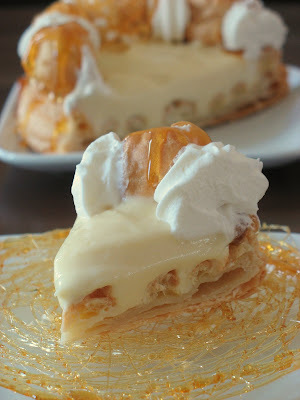 The recipe for the Saint Honore cream is flavored with rum and that may not appeal to you, so substitute an alcohol that you like more (Grand Marnier, White Godiva, Kirsch,…), or vanilla. 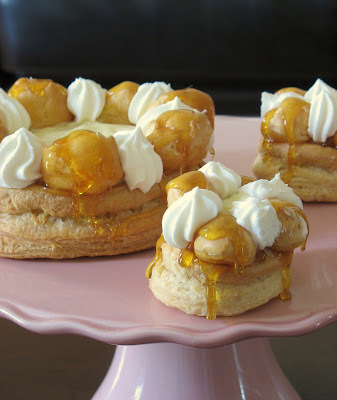 Puff pastry, Pate a Choux (Cream Puff Dough), Saint Honore Cream, caramel and whipped cream. Roll the puff pastry out to 1/8 inch (3 mm) thick, 12 inch square (30 cm). Place on a sheet pan lined with parchment paper. Refrigerate covered at least 20 minutes.While the puff pastry is resting, make the pate a choux and place it in a pastry bag with a # 4 (8mm) plain tip. Reserve.Leaving the puff pastry on the sheet pan, cut a 11 inch (27.5 cm) circle from the dough and remove the scraps. (An easy way to cut it is to use a 11inch tart pan as a “cookie cutter”). Prick the circles lightly with a fork. Pipe 4 concentric rings of Pate a Choux on the pastry circle. Pipe out 12 cream puffs the size of Bing cherries onto the paper around the cake. Bake the puff pastry circle and the cream puffs at 400F (205C) until the pate a choux has puffed, about 10 minutes. Reduce the heat to 375F (190C) and bake until everything is dry enough to hold its shape, about 35 minutes longer for the cake and 8 minutes longer for the cream puffs (just pick them up and take them out as they are done)Place about 4 oz (114 gr) of the Saint Honore Cream in a pastry bag with a #2 (4mm) plain tip. Use the pastry bag tip or the tip of a paring knife to make a small hole in the bottom of each cream puff. Pipe the cream into the cream puffs to fill them. Refrigerate.Spread the remaining cream filling on the cake. Refrigerate for at least 2 hours to set the cream. Caramelize the 8 oz. of sugar:Fill a bowl that is large enough to hold the pan used for cooking the sugar with enough cold water to reach halfway up the sides of the pan. Set the bowl aside.Place the sugar in a heavy bottomed pan and cook until the sugar until it has caramelized to just a shade lighter than the desired color. Remove from the heat and immediately place the bottom of the pan in the bowl of cold water to stop the cooking process. Dip the cream puffs into the hot caramel, using 2 forks or tongues to avoid burning your fingers. Place them on a sheet pan. The caramel must be hot enough to go on in a thin layer. Reheat if necessary as you are dipping, stirring constantly to avoid darkening the caramel any more than necessary. Also, avoid any Saint Honore cream to leak out of the puffs and get mixed in with the caramel while dipping as the cream can cause the sugar to recrystalize. Whip one cup of heavy cream and teaspoon of sugar to stiff peaks. Place the whipped cream in pastry bag fitted with a #5 (10mm) star tip. Pipe a border of whipped cream around the top of the cake. Arrange the cream puffs, evenly spaced, on top of the filling, next to the cream. Option: Before filling the cake, take care of the cream puffs, dip them in more caramel, hook them up to the base. Fill with the cream filling and fill the holes with the whipped cream. 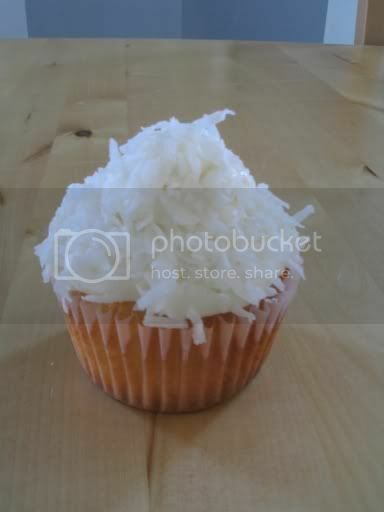 From the sneak previews and reports I got, it seems that the majority had a “good time” (it’s all relative with a lengthy recipe), and no major doozies, some had a runny pastry cream filling, some puffs had difficulty rising and we only had minor burnt fingers casualties. In my love of all things mini I did not go quite as small as last month crepe cake but I made 2 6-inch cakes and 6 3- inches. What I love about monthly challenges like these is to be able to take one recipe that we all follow and compare notes. 48 bakers means 48 ways to bake and 48 different experiences. I love it! 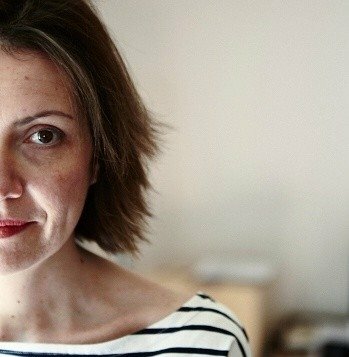 Head over to Anita's blog for the other 24 Daring Bakers! I now have even more appreciation for the beauty that you create. And I'm really in awe of doing this in a time of 4 hours, it's a lot of balls or puffs to keep in the air. It was a wonderful challenge and I certainly felt daring. bravo, belle réussite, et beau sucre filé aussi ! Beautiful as usual but I think that teeny tiny one is the cutest of them all. Ce Saint Honoré te fait honneur, il est magnifique. Helene, its simply beautiful, it makes me feel sooo amateurish but who cares, I'm having fun and I AM an amateur after all! Thanks for choosing this cake, I learnt a lot! Waaaahou alors ça c'est du gâteau. Ta présentation est une belle réussite! your desserts and posts are so inspiring! i am also quite fond of mini/individual desserts...so cute. how may i get involved in the daring bakers? many thanks, helen! Helen, in the beginning, I kind of "huh" when I saw combining puff pastry and cream puffs. I mean, each is 100% delicious on its own, but putting them up together sounded a little bit odd to me. But I was wrong, this pastry is 210% fantastic! Your Gateau St Honore is a work of art! Just stunning and a great challenge! What a wonderful choice! Congratulations on such a beautiful creation. It looks absolutely delicious too! oh, as usual your creations are so wonderful. I always sit and read your posts in awe.and then admire the photos..and plan to bake just like you one day. When I first read your post I freaked out at first thinking that I had missed the deadline.BIt it is today. I will be finishing mine later on in the day. Exquisite oh master! I love the sugar plates! Helene as expected yours looks just incredible. Love those spun sugar rings. A fantastic challenge that I enjoyed extremely! Le Saint-Honoré, une de mes gourmandises préférées, mais je n'ai encore jamais osé me lancer. Le tien est fantastiquement réussi et superbement mis en valeur par les photos...on en mangerait ! This is beautiful ,Helen! Thank you so much for the experience...I enjoyed it so much. I think this challenge epitomizes what it means to be a Daring Baker. Gorgeous and amazing Helene! I love all of your gateaux, but I agree with Mary, the teeniest just grabs my heart! I wanted to thank you so much for this challenge - it taught me alot and gives me a greater appreciation for all of the wonderful things you create! OH MY OH MY - you all DO amaze, for sure! I actually learned (in person) from Bo Friberg. This really was his pastry test (at least for the first part of the course). Of course he expected far more from us than just this, but it really is a good test of skill: puff, choux, chiboust, caramel...with just those skills you could probably make hundreds of different pastries. I hate to be redundant, but I have to say your creations are marvelous and your choice of this month´s recipe was perfect for all of us (caramel burns be damned!). And yep, our cakes look amateurish next to yours, but I really don´t mind. Can´t wait to see what June brings! I have been anxiously awaiting the next Daring Bakers post. What a treat to find this beautiful creation on my computer screen this morning! It is gorgeous, as usual! Because of you I totally have to add Bo Friberg's books to my collection! While I'm still not completely done my cake (can you believe it ...), I have enjoyed this tremendously. Especially making the puff pastry so than you to you and Anita! And of course, your gateau is a vision! Qu'il est beau le gateau! That's what I call a pastry chef. I love the individual ones. They are so cute. Thanks for this delicious challenge. Fabulous as usual. I expect nothing less from you! Very very pretty! I love the drippy sugar on the small one. Great challenge, thanks! Helen, thank you so very much for picking this challenge! I can't tell you how much fun it was and now I'm not afraid of puff pastry or cream puffs. Your cake is a masterpiece of elegance! Helene, you're amazing! I love your sugar discs. Thank you for a wonderfully challenging baking adventure. Thank you so much Helene for picking this. Though it gave me some difficulty, I am so happy now that I followed through on it, and I learned some much in the process. Great choice and fantastic job with yours. I told you.. it's 10 of midnight and I'm only at the T's. har! Thanks so much for choosing such an excellent challenge. You never cease to amaze me with your beautiful creations! I hope we made you proud! How cute the big Honorè with all its little fellows!!! I'm glad you chose this challenge, it was fun and tasty! Yours look so cute! I love the minis! Ohhhhhhh...yours it perfect. Look at that pastry. Sigh. One of these days, I'll have to give the puff pastry a go again. Your sugar is gorgeous, too! You are the pastry queen, sweetie! Your caramel "hat" for the cake is fantastic! Thanks again for letting me co-host Helene. I love the spun sugar perched so jauntily on the gateau. Beautiful as always! Wow Helene, yours looks fabulous. I love the sugar disk. Very, very nice!!! I love the baby version. 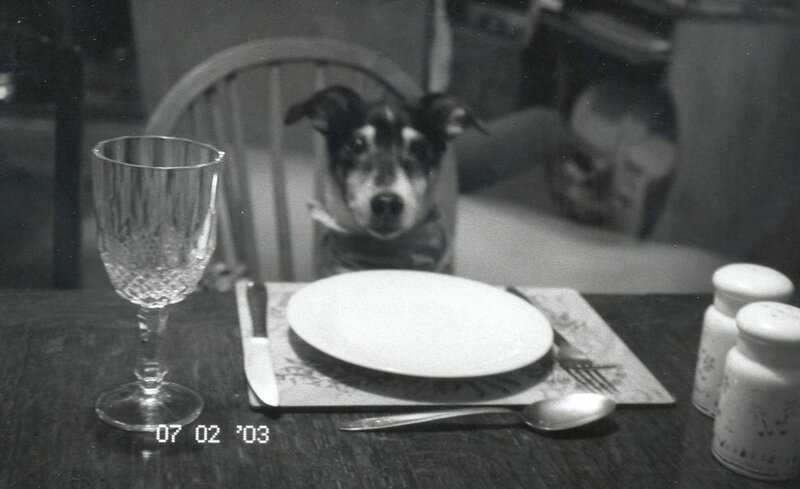 I wish I would have done something like that with my scraps of puff pastry, heck knows I had enough cream!! Thanks for making me dare to try new things. Helene, marvelous! And your skills with caramel, wow. Helene! Lovely. I always look forward to seeing your creations. You DB's never cease to amaze me. This is a beautiful creation! Well... what an amazing event you and Anita have hosted -- and what gracious, helpful hostesses you've been. Thanks for providing the inspiration I needed to take this challenge on. In addition to learning the amazing seductive powers of diplomat cream, I've learned several techniques I *know* I'll use again! One of my favorite dessert... you just prepared it so perfectly! I definitly need to try it!